In case of interest please contact us! 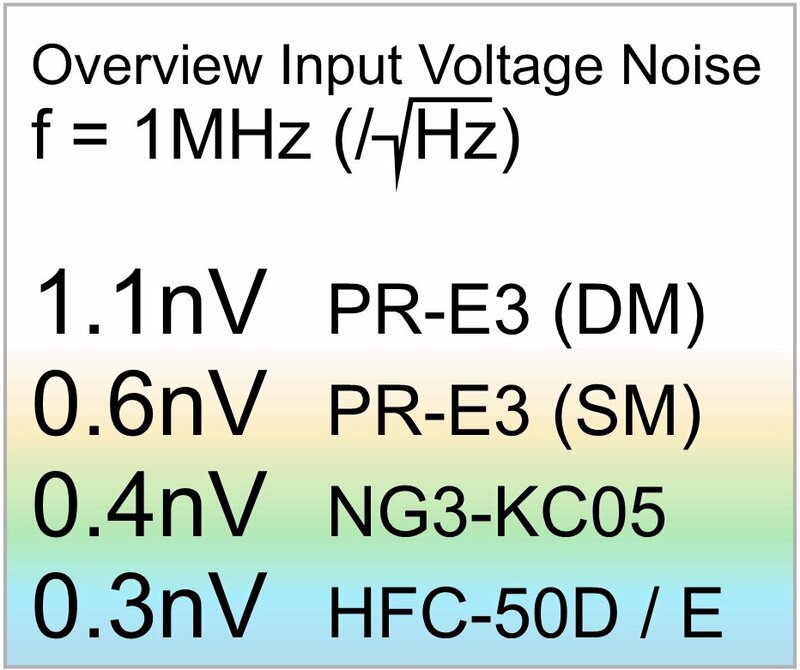 The new PR-E 3 - SMA is a highly sensitive voltage preamplifier, which is intended for low-noise and high-impedance applications like FT-ICR cells, Schottky pickups or charge detectors. 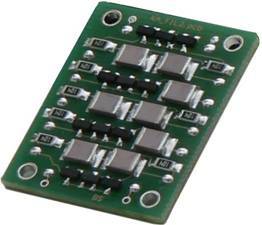 It features a design which can be used in dual-channel or single-channel configuration, exhibiting both low voltage and low current noise figures at small input capacitances. The frequency comprises 0.5 kHz to 3MHz, at a nominal voltage amplification factor of 250 V/V, or 125 V/V at 50 Ohm load respectively. The small size makes upgrade of existing systems easy, improving sensitivity and delivering a better signal-to-noise ratio. 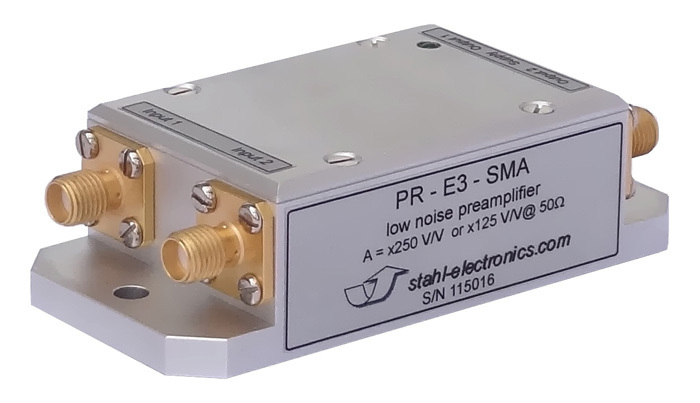 The PR-E 3 - SMA is implemented as solid box of an Aluminium alloy with gold plated input/output SMA terminals, offering very high immunity to external noise interference. 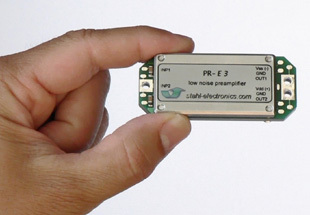 The former version PR-E 3 offers the same features as the new model, without SMA connectors and mains supply. It is specially suited for setups where available space is of concern. 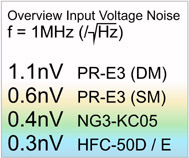 Custom specific low noise preamplifiers can be tailored to your needs. Contact us! We have many years of experience in the development of cryogenic electronic components and modules, which are used at low to lowest temperatures (77K...4,2K). Custom specific units like amplifiers, coupling stages, filters etc. can be tailored to your needs. 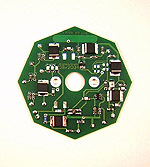 Additionally, we can offer a variety of already developed standard modules. Contact us! 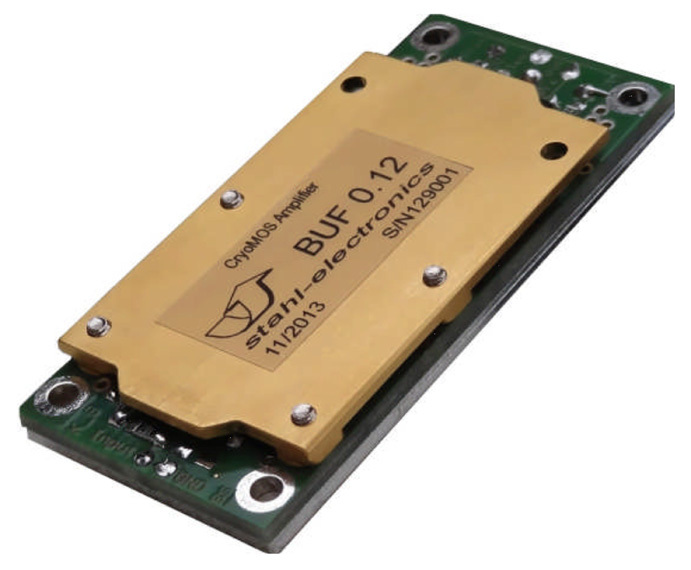 Pictures: Low-noise amplifier module for the frequency range DC...4MHz, suited for continuous operation at 4K (= - 269°C) (left). 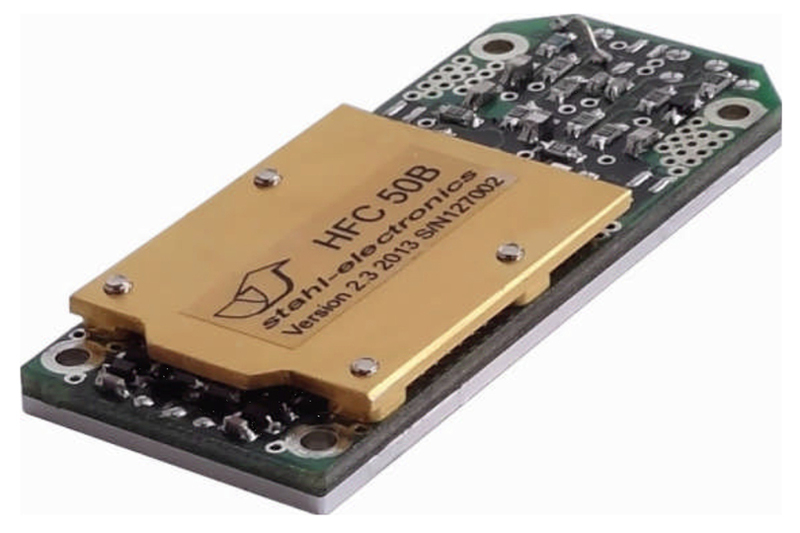 Highly sensitive FT-ICR amplifier module for use at 4K. 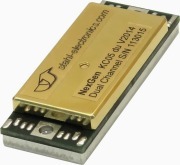 This module provides two independant channels for narrow band (Δf = 1kHz) and wideband (40MHz) FT-ICR detection of single or few ions (right). Our filter unit KA-Fil 2a contains 5 independent low pass filters for room temperature and cryogenic use. The main application is the creation of low noise environments in cryogenic experimental setups. Internal Schottky diodes, which are able to operate in cryogenic environments, allow for deliberate filter bypassing, in order to apply electrical pulses or frequency bursts.